A Cam Walker is designed to help injuries heal, these can include soft tissue and bony injuries. The Podiatry Group have qualified Podiatrists specifically trained to fit Cam Walkers/Moon Boots. We are able to offer same day fitting at our Warragul, Drouin and Cranbourne Podiatry Clinics, this way you will be able to begin the healing process sooner. A Cam Walker works by reducing movement and pressure on an injured structure. The “CAM” is an acronym for Controlled Ankle Movement, as such it allows an injured foot, ankle or leg to recover quicker as there is less stress and strain on the affected area. 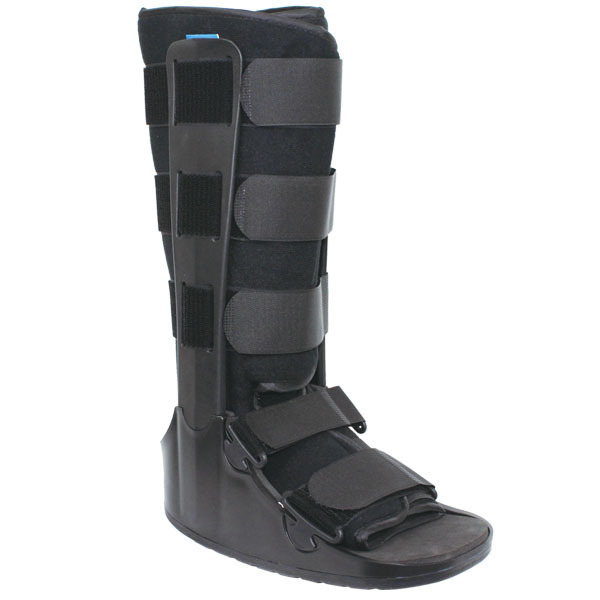 The benefit of a CAM Walker is that unlike a plaster cast, it can be removed at night when going to bed or showering. This is helpful as it can allow for some non-weightbearing movement at the ankle joint which reduces the risk of the joint becoming really stiff after prolonged periods in the boot. This also makes rehabilitation easier after the boot is finally removed. A CAM Walker is mostly used without any other form of support like crutches. However, there are some injuries at the initial stages that will require a patient to use crutches in addition to a CAM Walker. We are able to fit you with crutches if the need arises. Get the healing started now by calling one of our team on 1300 847 226 or book online for our Warragul, Drouin or Cranbourne Podiatry Clinics. We know how much you love to be active, we love it too! Our friendly team are here to help keep your feet happy and healthy. Contact us for an appointment or make an appointment online.